Dual microUSB/USB OTG sticks may not be brand new anymore, but they're still not nearly as prevalent as more traditional flash drives. Nevertheless, there are plenty of options out there from the big brands and lesser-known folks alike. A year ago, Leef Bridge announced a model with support for USB 3.0. A year later, SanDisk is now doing the same. The SanDisk Ultra Dual USB Drive 3.0 is a slightly redesigned version of the previous model, only it now handles faster transfer speeds. The stick still comes in the same sizes: 16GB, 32GB, and 64GB. Prices range from $22.99 to $64.99, depending on which one you pick up. You can use the SanDisk Memory Zone Android app to help manage your files, but it isn't required. For a refresher on how these things work, here's our hands-on look at the previous SanDisk model. Or if you don't want details, here's a short trailer. 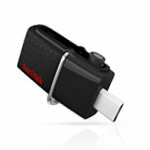 LAS VEGAS--(BUSINESS WIRE)--SanDisk Corporation (NASDAQ:SNDK), a global leader in flash storage solutions, today announced SanDisk Ultra® Dual USB Drive 3.0, a USB flash drive featuring both a micro-USB and a high-speed USB 3.0 connector for super-fast file transfers between On The Go (OTG)-enabled Android™ devices1, PC and Mac computers. Adding to its portfolio of innovative memory solutions, including SanDisk’s current, extremely popular SanDisk Ultra Dual USB Drive 2.0, the new SanDisk Ultra Dual USB Drive 3.0 enables mobile users to transfer files even faster, as well as free up space on their smartphones and tablets. The drive simply connects via micro-USB to a compatible Android device and gives users up to 64GB2 of extra storage instantly. The new SanDisk Ultra Dual USB Drive 3.0 sports a slick retractable design for easy usability, as well as a longer micro-USB connector to accommodate device cases or port covers. The USB drive offers a convenient way to transfer and share content via an Android-powered smartphone or tablet’s micro-USB port without the need of cables, email or wireless set-up. The drive also offers USB 3.0 performance at up to 130MB/s3 from the drive to the computer for users to quickly transfer and back up photos, videos and other files originally taken with their smartphone. The SanDisk Memory Zone app, which has been downloaded more than two million times via Google Play™ store, gives users even greater control over their mobile device’s memory storage4. SanDisk’s Memory Zone app is compatible with most Android-powered devices and allows users to easily locate, organize, transfer and back up data. When the new SanDisk Ultra Dual USB Drive 3.0 is connected, the Memory Zone app auto-launches, and allows users to easily manage and transfer content between their mobile device and the drive. SanDisk Memory Zone app is currently available for free from the Google Play store. The SanDisk Ultra Dual USB Drive 3.0 is available worldwide in 16GB to 64GB capacities with MSRPs of $22.99 to $64.99, respectively, at www.SanDisk.com.